Coffee dripped on a white tablecloth or your shirt or your seatcovers. This type of stain has long been considered difficult (if not impossible!) to remove. 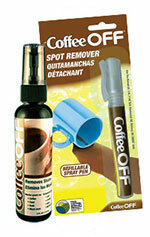 Now, Summit International is proud to offer the solution to this cleaning dilemma: Coffee OFF! Using our specially developed formulas of friendly bacteria and enzymes, Coffee OFF actually eats the stain, leaving your clothing, table linens or carpeting stainfree. Coffee OFF is also effective on food residue and other organic stains. We employ friendly bacteria so that we can assign billions of workers to every clean-up: it’s long hours with no pay, but we promise them all they can eat! Made with nature-based, non-toxic ingredients, Wine OFF and Coffee OFF are safe to use around people and pets. The biodegradable ingredients are environmentally friendly as well. Red wine spilled on a white carpet, Spaghetti sauce on a white blouse, Gravy stains on your favorite tie. These kinds of stains have a long history of being nearly impossible to remove. Until now, that is! At Summit International, weíve applied our revolutionary “green” bio-enzymatic technology to solve these all-too-common cleaning problems with a very special new product: Wine OFF! Using our advanced formulas of friendly bacteria and enzymes, Wine OFF lliterally “eats” the stains, leaving your wardrobe, table linens, rugs and carpeting spotless. 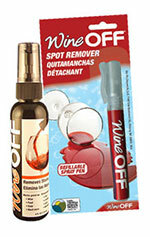 Wine OFF attacks organic stains using an army of billions for every drip, spill or splash! Made with biodegradable ingredients that are nature-based and non-toxic, Wine OFF is safe to use around people and pets and environmentally friendly too. No “oxy-powered” (peroxide) components or other bleaching agents, no toxic alcohol, and no harsh detergents are used in our unique approach to stubborn stain removal.